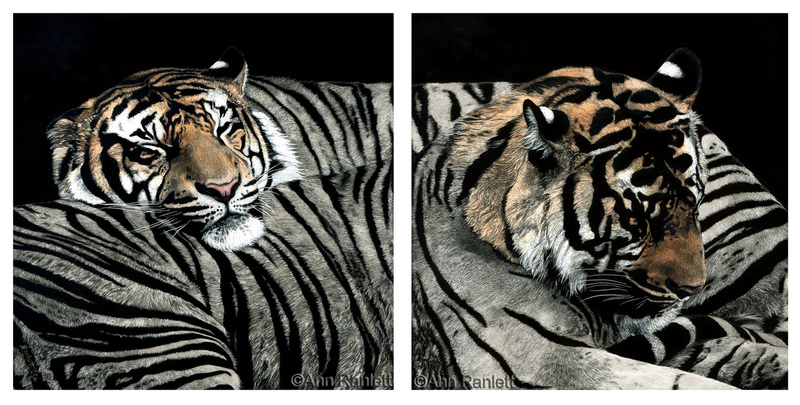 I’m thrilled and honored to announce that “Sleeping Patterns”, my scratchboard drawing of a pair of Sumatran Tigers, has been accepted in the Society of Animal Artists‘ 56th Annual Exhibition. The Exhibition runs September 23, 2016 through January 1, 2017 at the Houston Museum of Natural Science. After the Exhibition ends in Houston, there will be a touring exhibition of select works. It’s a possibility that these tigers could do some traveling. Read more about the process and see in-progress stages in this blog post I wrote just after completing the drawing. Click here to see a “zoomable” version of the drawing. This entry was posted in events, scratchboard, shows. Bookmark the permalink.